This simple paper angel craft will help your child practice cutting out circles. Use the free downloadable template to help your child create large and small angels for the Christmas tree or for pretty table decorations. Although your child will be decorating and cutting out the angels, adult guidance may be needed in assembling the angels, according to your child's ability. Not suitable for little ones owing to the beads and scissors used. You can draw little faces onto wooden beads like these ones from Amazon . This is an affiliate link and I will earn a small commission if you purchase a product through my links. crayons, glitter or anything else to decorate the angels. It is optional to decorate the circles, but my kids loved it. Plain white angels are equally attractive! Once they are decorated, have your child cut out the circles and then cut out the wings on the light lines. You may need to help younger kids. View this page for tips on teaching your child to cut with scissors. Apply glue to one of the cut edges as shown. Fold one cut edge over the glued cut edge. The body of the angel will look like this, with a tiny hole at the top. You need to apply the glue to the decorated side and apply the wings so the decorated sides face forwards. Cut the chenille stick into quarters, and use one quarter per angel. Thread the chenille stick through the neck hole, from inside the "skirt". Make a loop to stop the stick from passing right through, or attach a little bell at the end. Pull the rest of the chenille stick through at the top. Thread a bead onto the head. Look for beads from broken necklaces, or wooden beads with painted faces from craft shops. Wrap the chenille stick around a pencil to make a loop and smush it onto the angel's head for a halo effect. It's fine if a bit of stick pokes out - use it to hang the angel on the tree. The finished angels. So sweet, and by far the easiest paper angels I have made with or without my kids! The paper angel craft is one of 12 different activities you can find in my Christmas Scissor Cutting E-Book - lots of photographed instructions and templates for each activity! Check it out! 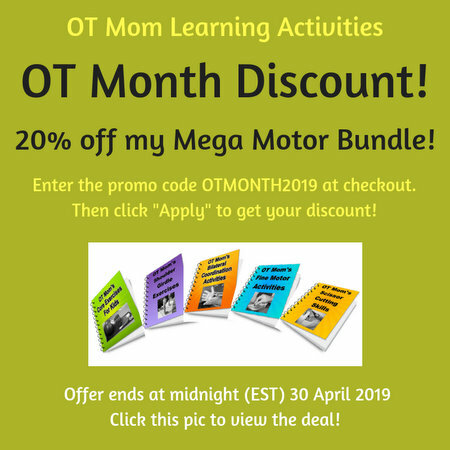 Why not sign up for OT Mom Activity Updates - my occasional newsletter to keep you in touch with the latest additions to my site?